Former Kyrgyz President Kurmanbek Bakiev said the resignation he signed had not come into force because the interim authorities reneged on a promise to protect his relatives. 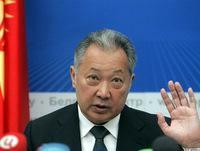 Kyrgyzstan's ousted president, Kurmanbek Bakiev, has said he does not "intend to return to Kyrgyzstan as president." "I am not clinging to the presidency," Bakiev said, adding that he was ready to help stabilize Kyrgyzstan. Speaking at a press conference at the National Press Center in the Belarusian capital, Minsk, Bakiev said that he did not acknowledge his resignation. "Bakiev is still the legitimate president," he said, although he acknowledged writing and signing his resignation statement last week. Bakiev arrived in Minsk on April 19 on the invitation of Belarusian President Alyaksandr Lukashenka. He initially left Kyrgyzstan for Kazakhstan last week, following bloody unrest in Bishkek earlier this month that left at least 85 people dead. The interim government in Bishkek, formed after ousting Bakiev, maintained that he resigned when an agreement on his departure was brokered with international mediation. Regional media in Central Asia published a copy of what appeared to be Bakiev's handwritten resignation letter. But Bakiev said today the resignation he signed had not come into force because the interim authorities reneged on a promise to protect his relatives. "But it doesn't mean I don't recognize my resignation and want to return to Kyrgyzstan as president tomorrow," Bakiev said. "No. I want to make it clear once and for all. I do not intend to return to Kyrgyzstan as president." The former president told reporters today he had not expected demonstrations in Kyrgyzstan would lead to his ouster from power. "There was nothing to indicate a revolutionary situation" in the events leading up to the bloody political unrest of April 7, he said. 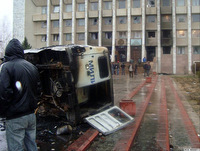 "In Kyrgyzstan we are used to opposition demonstrations," Bakiev said. But he added that his government during its five years in power had achieved a lot in terms of raising living standards and improving the economy. Various demonstrations had taken place in different regions in Kyrgyzstan in the months leading up to the April 7 uprising. There were protests against new utility prices, which increased substantially as of January 1. Others demanded Bakiev's son, Maksim, who was in charge of an investment and innovation agency, leave the country. During today's press conference, Bakiev blamed some price hikes in Kyrgyzstan on Russia's introduction of custom duties on fuel-lubricant materials. He said Russia's decision had "shocked" him. Bakiev said Russian President Dmitry Medvedev and Prime Minister Vladimir Putin had also been unhappy with his decision to extend the lease of the U.S. air base at Manas airport, outside Bishkek. "I told them: 'Why does this base worry you so much? There are no armaments that would pose strategic threats to Russia and so on,'" Bakiev said. "It must be said frankly that Russia's leaders were unhappy and irritated with the presence of a [U.S.] military base in Kyrgyzstan. And that factor also played a certain role." Bakiev also said those who are close to him are now being harassed in their native Jalal-Abad, despite promises that there would be no repressions against his relatives and colleagues. Back in the southern Kyrgyz province of Jalal-Abad, the ex-president's family says his brother Akmat has been missing since April 21. 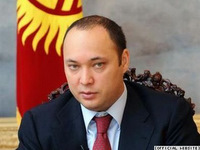 According to Kyrgyz media reports, many people have dismissed the claim as an effort to discredit the interim officials. At the same time, interim officials have said they don't rule out the possibility of asking for Bakiev's extradition to face charges in connection to the April 7 deaths. There were also public calls for Bakiev to stand trial for polygamy. Bakiev left Kyrgyzstan along with his second wife and their two children -- a son and a daughter -- previously unknown to public. Bakiev is officially married to Tatyana Bakieva, who sometimes appeared alongside him in public as the country's first lady. Together they have two grown-up sons, Marat and Maksim. The whereabouts of Tatyana Bakieva and her sons are not known. Bakiev today gave no indication about his immediate plans. In an interview earlier this week he said he would prefer to live in a Commonwealth of Independent States country. The former president also told the "Russian Reporter" magazine that he might try his hand at toy making.